EAST LANSING, Mich. - Golf is often considered an individual sport, because, outside of the player, instructor and caddy, there’s no real team or family around. The Michigan State men’s and women’s golf teams have chosen to create a different atmosphere, making togetherness its identity. The programs interact through social events at the Lasch Family Golf Center, and by internal competitions such as an end of the year scramble. This close-knit, family atmosphere stems from the philosophy installed by former coaches Mary and Bruce Fossum, the married head coaches of their respective programs. Mary coached the women’s team from 1973-97 and Bruce helmed the men’s team from 1965-89. Slobodnik-Stoll, who played for MSU from 1989-94, said she was ingrained into this way of thinking from the moment she joined the team. The tradition has continued because of Slobodnik-Stoll and men’s head coach Casey Lubahn. 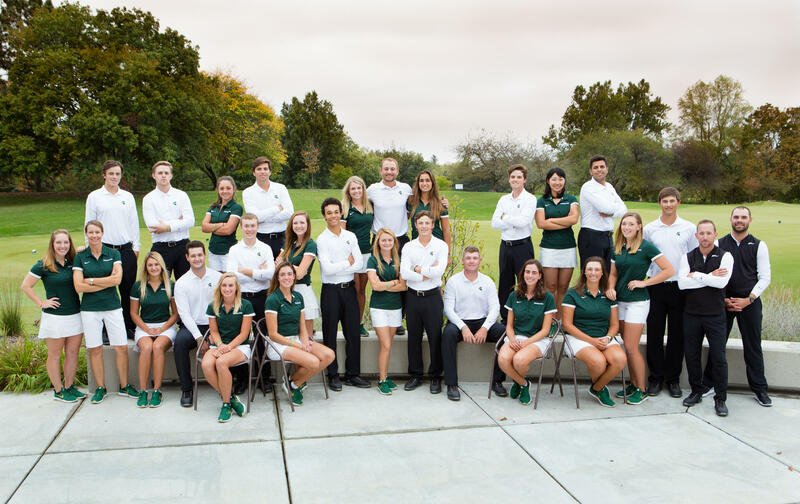 They work to keep the programs’ intertwined a main focus of Spartan golf. Having the two teams be so linked is unique, according to Slobodnik-Stoll, and is something not always seen in collegiate golf. The interaction between the teams leads to growth, and Slobodnik-Stoll and Lubahn have seen players learn from each other. Lubahn, the captain of the 2003-04 MSU team, learned from Slobodnik-Stoll and former LPGA Tour member/Spartan Allison Duncan. Lubahn explained the differences between the styles of play of the teams, with the women more consistent and strategic, while the men are more aggressive and take more chances. A combination of both of these styles, he said, is “obviously a great approach”. When each team takes to the tee box, one will sometimes win a tournament. When they do, the other team and other members of the winning squad, will cheer them on from the course or back home in East Lansing. “That’s exhilarating to know that you got so many people on your side pulling for you and cheering for you,” Slobodnik-Stoll said. One of the ways the teams are able to interact and support each other, is the Lasch Family Golf Center. The facility finished construction in spring 2016, and replaced the Rearick Golf Center. The golf center features modern amenities, such as an indoor putting and chipping green, and a ball tracking system which is used a lot during the off-season. It also has community areas, such as a hang-out area and a family room. Lubahn and Slobodnik-Stoll had input into their new home, and made sure a communal places were designed into the building. “We wanted to have a space where we can sit both teams, where they can study and laugh, they can play games, they can watch TV, they can listen to music, just like your family room at home,” Slobodnik-Stoll said. Slobodnik-Stoll said most college golf facilities don’t have a family room or hang-out area, which allows MSU golf to maintain the family atmosphere.